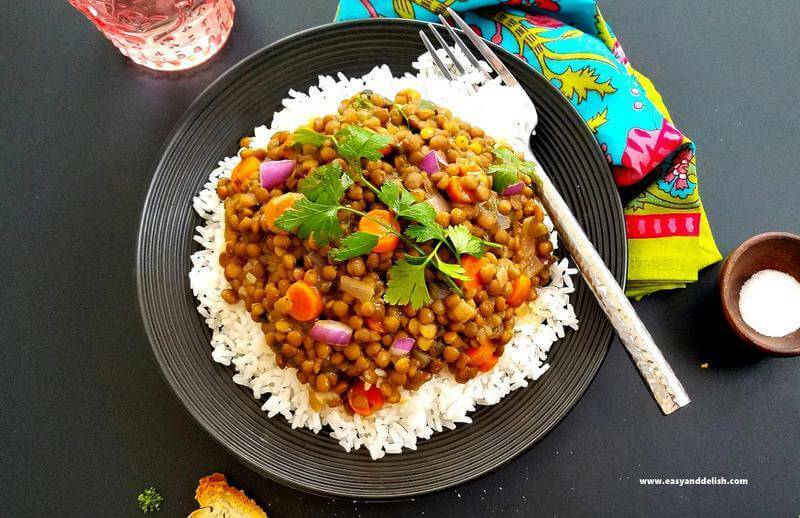 A vegetarian lentil coconut curry that can be prepared in less than 30 minutes and makes for a perfect, healthy weeknight dinner. It can be served over rice and/or with naan bread. Love Indian food — and more specifically curries? Me too!! This vegetarian, gluten-free Lentil Coconut Curry is inspired in the hearty and comforting flavors of Indian cuisine… with the spiciness dialed back a bit. A real plus here: it was ready in less than 30 minutes. Don’t believe me? Well, check out the secret! All it takes is basically onions sweated in vegetable oil, carrots, canned lentil soup, coconut milk, spices, and lime juice to prepare this freaking delicious stew. Just like that– simple! 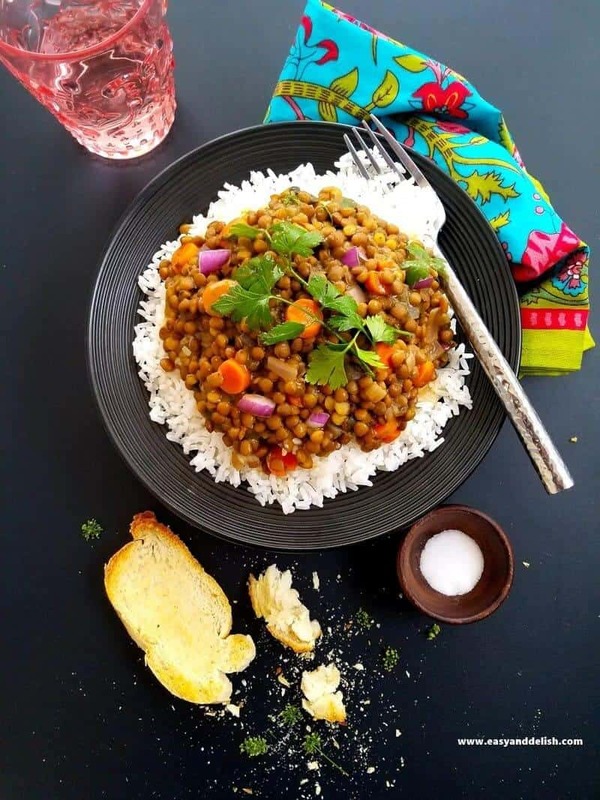 The use of canned lentil soup cuts the cooking time significantly, making our Lentil Coconut Curry ideal for busy weeknights. This means you can come from a tiresome day of work and still fix yourself or your family a very nice meal without all the stress and the time usually required. You are making magic in the kitchen, hon! 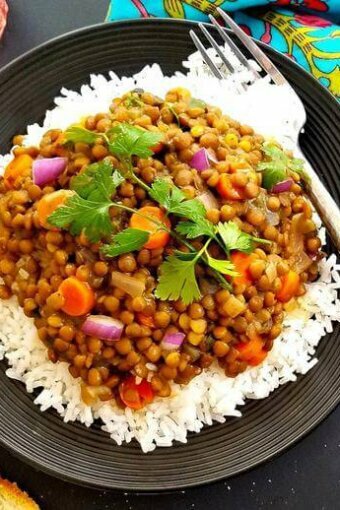 Our Lentil Coconut Curry can be served over rice and/or accompanied by naan or any other bread of your choice. Since I forgot I had a package of garlic naan in the freezer, I served with toasted French bread and it was delish. If you like crackers, well hey you could even use those instead. It’s all up to you! This is a healthy, no-fuss, dairy-free and naturally gluten-free meal, and we want to keep it like that, right? Making your life (and mine) simple is my mission. 😉 And that is so true that we have many more quick and easy weeknight dinner ideas awaiting you here. I hope you enjoy our Lentil Coconut Curry and get some well-deserved rest. A prize for those who work hard on a daily basis, without neglecting healthy eating. In a dutch oven or large pot, heat the oil over medium heat and sweat the onion for about 3 minutes or until fragrant, stirring every now and then. Don't let brown! Add the lentil soup, coconut milk, tomato paste, all the seasonings, and spices. Stir well until combined and increase heat to medium high. Bring to a boil; then reduce heat to medium, add the sliced carrot and bay leaf, and let curry cook, uncovered, for about 7-10 minutes. Stir occasionally if necessary. Stir in lime juice and chopped cilantro or parsley. Serve hot over rice and/or accompanied by naan or any other bread of your choice. I served with toasted French bread. Such a savory dinner recipe! 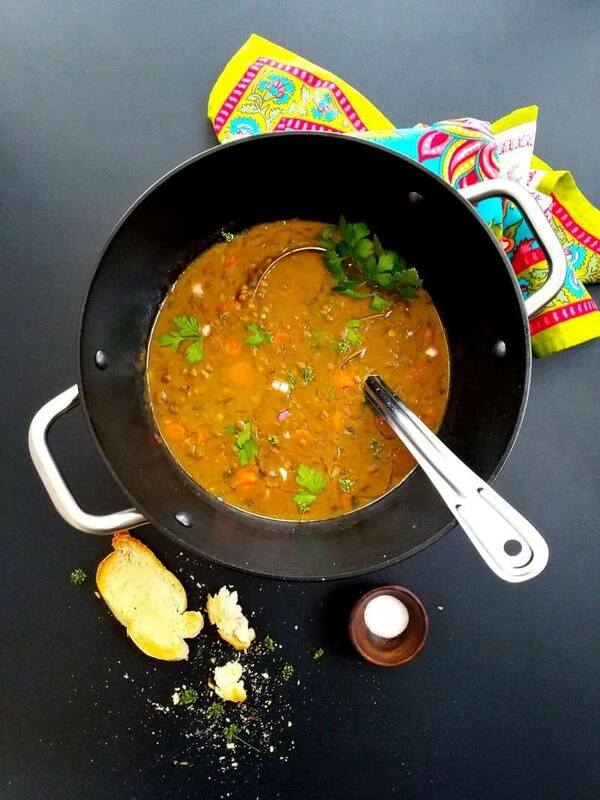 This lentil curry would be fabulous with naan bread and a green salad. AMAZING!!! I can’t wait to try this dish. It has been a little cooler here (21c) which is perfect for a hearty and warming curry. Cant wait to try this, love that it can be in my belly so quickly too. Wow, what nice flavor! Terrific dish — very creative. Thanks! Thank you for stopping by. 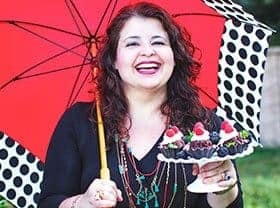 Yes, this is one of those recipes that one can put together quickly and it is a crowd pleaser. I hope you give it a try and enjoy! Wow…this doesn’t take anytime to put together and it sounds terrific. 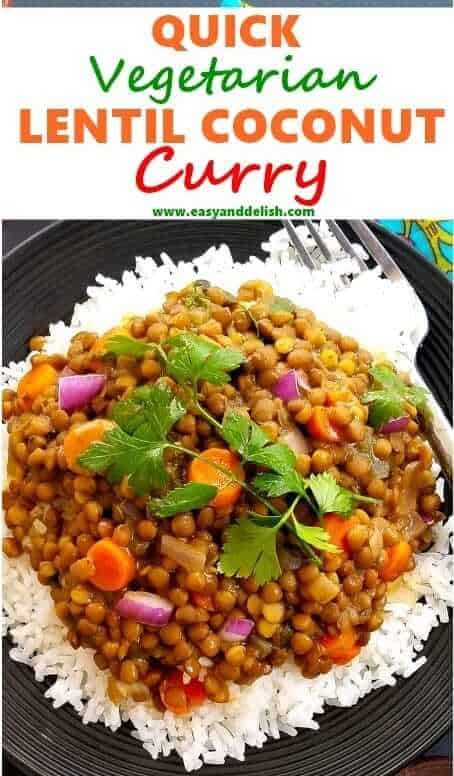 Well we may not have canned lentil soup here, but we sure can use this recipe and make a fantastic meal:):) As you may have notice from the usage of garam masala in some of our recipes, we’re BIG fans of Indian food and this one hit the nail on the head. So yummy! I say that as a no vegetarian.